I have a line in ArcMap 10.2, and want to create lines to the right of it at 100 m, 200 m, 300 m etc. up until 1.7 km. Obviously typing in these values under 'multiple ring buffers' will take too much time. Is there a way for ArcMap to compute this automatically across the equal intervals? If you could answer through basic ArcMap methods that would be great. I do not understand the coding language that some of you use! 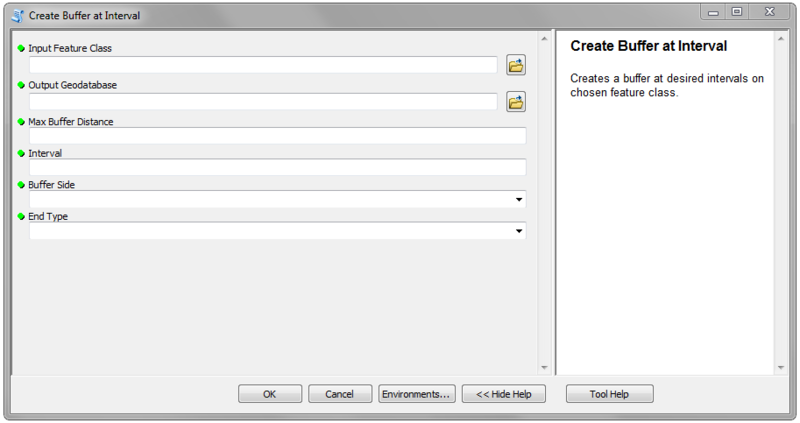 In ArcMap open ArcToolbox, right click in the whitespace and click Add Toolbox. Browse to the one I made and run the Create Buffer at Interval tool. It should be pretty straightforward, but let me know if you have any questions! Not the answer you're looking for? Browse other questions tagged arcgis-desktop arcgis-10.2 buffer or ask your own question. How to create multi-ring buffers automatically in QGIS? How to calculate proportion of a line segment around a point? How do I calculate the percentage of a line which falls in each of my multiple ring buffers? How to create square buffers around points in QGIS with Python? How to create rectangular buffers around points in QGIS with Python?